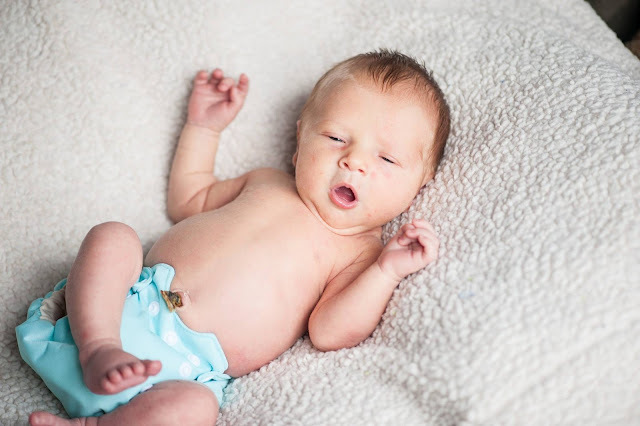 I received a complimentary Smart Bottom organic newborn cloth diaper to provide this review. I received no additional compensation. All opinions are 100% my own. "Our Born Smart Newborn diaper is an organic AIO diaper that fits most babies 6-16lbs. The interior of the diaper boasts 3 layers of organic cotton sewn in to the diaper and an additional 4 layer snap-in insert (included). The unique design allows for easy cleaning and quick drying, with enough absorbency to grow with your newborn. This diaper also has one rise setting, an umbilical notch, and a hidden pocket under the lining to add additional absorbency if needed." You can purchase Smart Bottoms Cloth Diapers on Amazon or directly from their site! My little man isn't so little anymore and he out grew his beautiful newborn diaper quickly. But I love the beautiful blue and that we were able to cloth diaper from the very beginning. The snaps make everything super easy to make sure the fit is perfect. What are some of your favorite features of the Smart Bottoms Newborn Organic Cloth Diaper? That's great it still fits at 13 pounds! I'll put these on my wish list because I like a diaper they don't outgrow too fast. I like that the size range is decent and can last longer than some other newborn diapers! I have a little one coming in August, and these seem like great newborn diapers. I love that they go up to 16lbs - way longer than most newborn diapers. Thank you for the informative review and the beautiful pictures! i would love to try these with my next child they seem to get a good fit right from birth definitely something to look into thanks! i love the hidden pocket idea for more absorbancy!!! I'd never heard of this brand before reading this, and I love that they have the umbilical notch in them! I was worried about that with doing cloth diapers. Good to know! It's good to know that it will probably fit up through 13 pounds-ish! My last baby was over nine pounds when she was born. :-P She didn't really fit into newborn clothes for more than a few days! I like that it is made of cotton, and has a belly button cut out! Si cute! i love that it is organic cotton next to baby's skin, rather than synthetic materials! I would love to try these. The pictures you posted are beautiful! Thanks for the review. I like that it has a snap in insert to add more abosobancy. Some of the nb diapers don't hold enough! I love the OS AIOs so I will for sure get some nb's for the next baby! I have heard of smart bottoms before but I've never tried them. They look great. What a beautiful little blessing! Congratulations! Congratulations and thank you for introducing me to this newborn diaper! I am wanting to have a few newborn AIO on hand with natural fibers for our 2nd due in Aug.! Thanks for sharing! Our little one is due in July. I love the size range and the umbilical notch! I love how customizable it is! I think AIO is a great option for newborn, despite people telling me that I shouldn't waste money on NB diapers b/c they don't fit long. My babies are on the small side, under 7lbs, and they fit for over 2 months. If they come fairly cheaply, I think it's worth savingn the $100 or more that we would've spent on disposables. Also, if there's more than one kid in the plans then they'll certainly get their use. I know people who would love to try these. Oh, he is so adorable. I can't wait to cloth diaper for ours! I love that it's quick to dry. Looks so soft and comfortable.